I’m not the type of person to be really into makeup. My mother only ever wears foundation and lip stick, and that’s all I ever saw when I was growing up. I didn’t even know you are supposed to put primer on before foundation until like a year ago. Needless to say when it comes to make up I can be clueless, but I’m learning. Lately I’ve been playing around with photo editing app’s. I have been obsessed with making my photos look more professional because I don’t have a good camera right now. Majority of my pictures are taken on my iPhone 5s and the camera is not totally up to my standards. I took a lot of photography classes back in the day so I’m really critical of the type of pic’ s the iPhone produces. I’m also very concerned with my layout looking good. This is sometimes hard for me to do because my computer has been on the Fritz. So pretty much everything I do is done through my iPhone. Some of the apps that I’ve Been using lately are VSCO short for visual supply company. 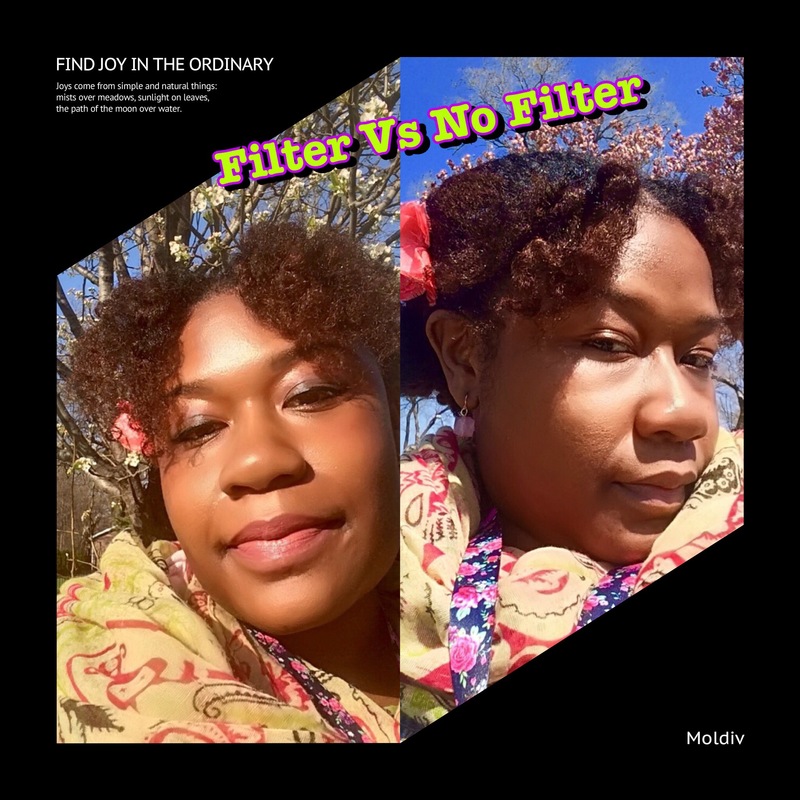 This app has a large slew of filters that can be adjusted with their editing tools. 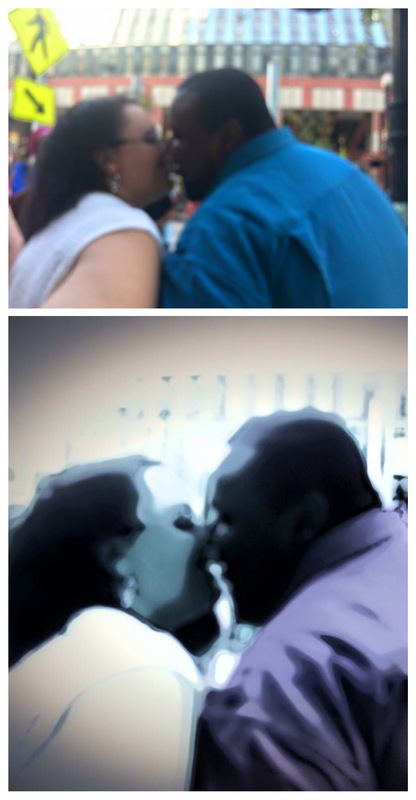 I use Moldiv as a collage/photo editor. They have some really great magazine layouts. I use Repix when I feeling artsy. It’s half painting app half photo editor. Last but not least perfect365. This app right here is a special one. You can essentially completely alter your appearance. 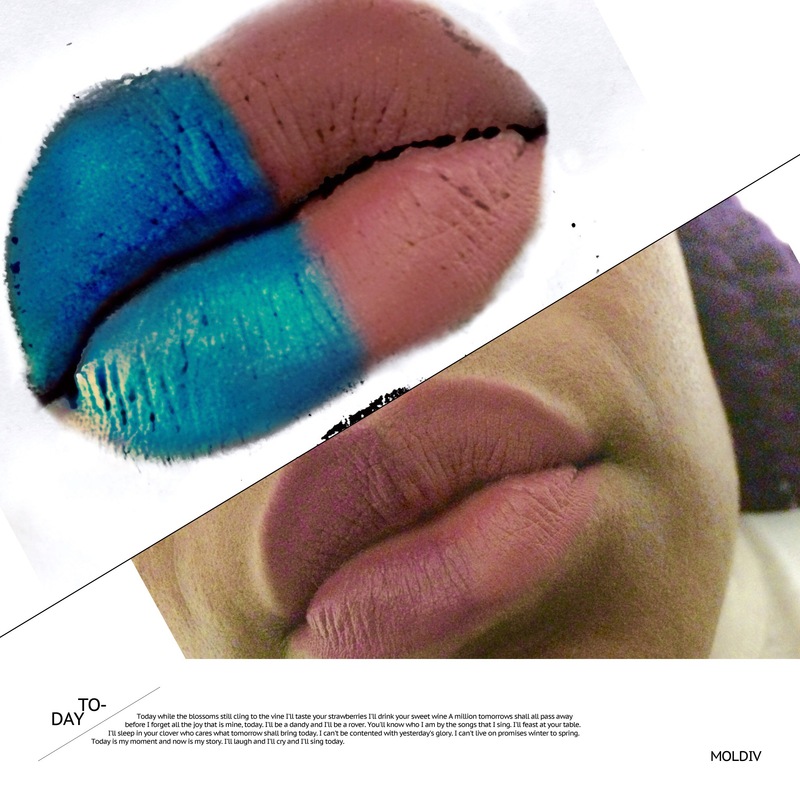 It’s a makeup app that if you use it correctly you can make a seamless transformation. Put all of these apps together and if you tweak them just so your iPhone photos will look like you used a $800 dollar camera. I’m still working on my technique. Some of the apps I’ve used in the past are Picplay, Pic Jointer, Camu, InstaVid video and photo collage, Snapseed, LiveCollage, Kia Xia photo collage maker. I went through a lot of apps on my pursuit to find the best. Now that I’ve assembled what I feel is my dream team of apps I’ve come up with my pro’s and con’s of photo retouching. Let’s face it if you’re working with a sub par camera your photos can come out poorly lit, heavily pixelated, grainy, and out of focused. For the most part I use most of these apps to counteract or undo poor visuals. I’ve found that most people online won’t take you seriously if your pictures look unprofessional. Sometimes you can’t reverse the effects of a bad photo but you can add filters that can make it look artsy, so no one can see the bad effects. If your photo is badly lit you can use tools on a lot of these app’s to create faux lighting. An older app I use to use called snapseed even has the tools to burn certain parts of your pictures that have to much light. That app especially reminded me of being in the darkroom with my burning tools. Basically most of these apps make photo editing easy with out all the work, or expense. Ok now I’m really going to get into the psychological aspect. 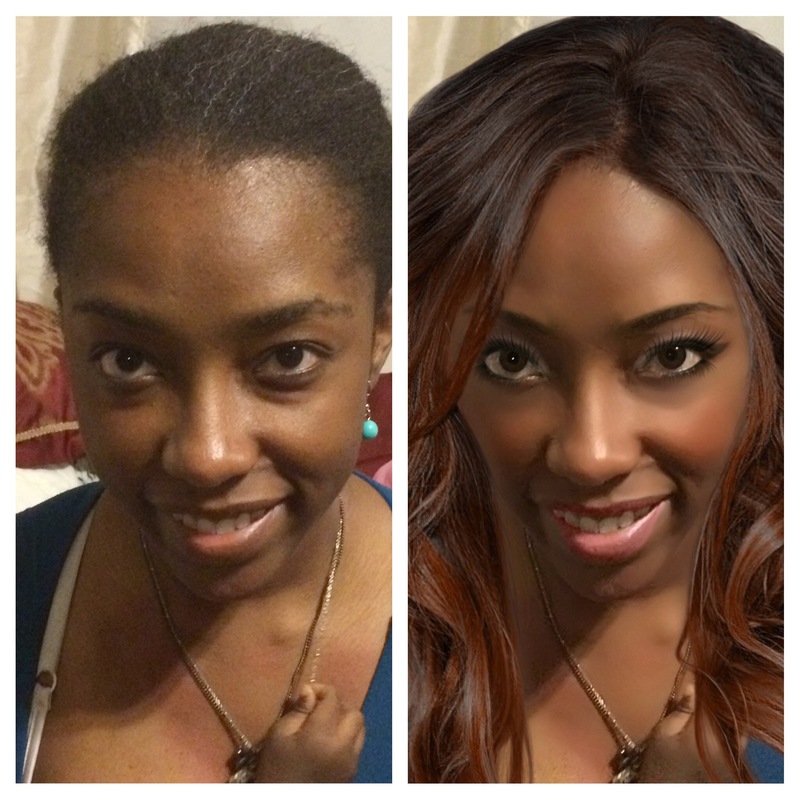 Perfect365 is an amazing app that meticulously changes a bad face day. However it makes me extremely concerned and self-conscious. 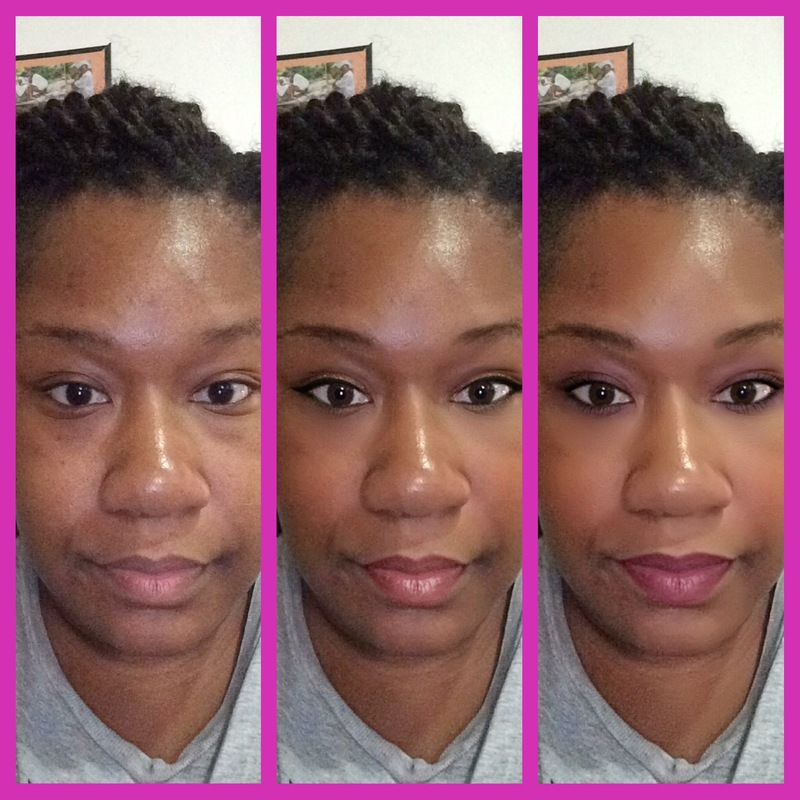 With this app you can create the effects of a full face of make up. You can lighten your skin tone, slime down your face and nose. Widen your eyes, while removing bags, soften your skin, remove blemishes. If you haven’t done your eyebrows in a while you can darken and arch them. If your eyelashes are to short you can darken and elongate them. You can deepen your smile, enlarge your lips, Whitten your teeth, and widden your eyes while making them appear whiter or just change the color altogether. You can even add fake hair. 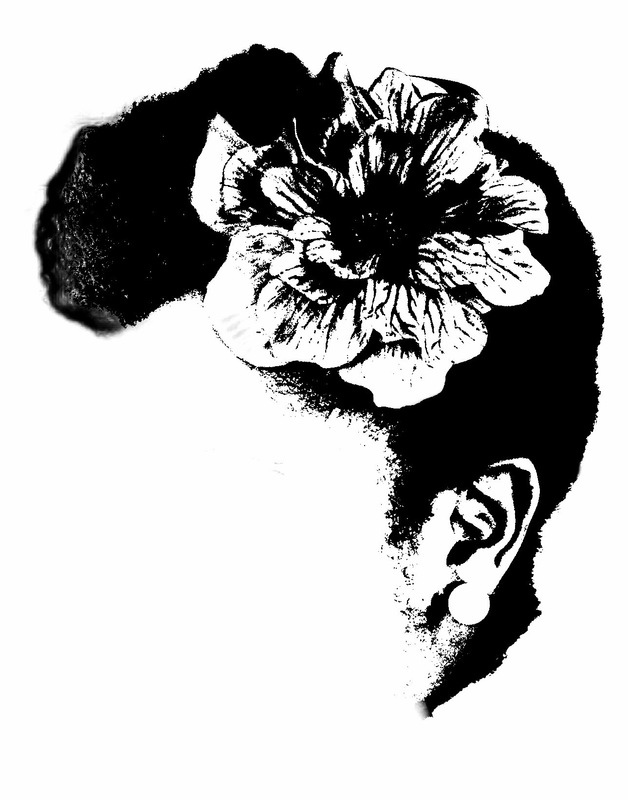 When I first downloaded this app I did it as a joke to make Bride of Frankenstein like monstrosities. I even deleted it once. But as I explored and fiddled with the app more I became better at marking the pictures look more realistic. That’s when the trouble started. Whenever I posted an edited picture Vs a none edited one I got an overwhelmingly favorable response from the edited pics. The comments are usually praising me for my beautiful skin and youthful glow. 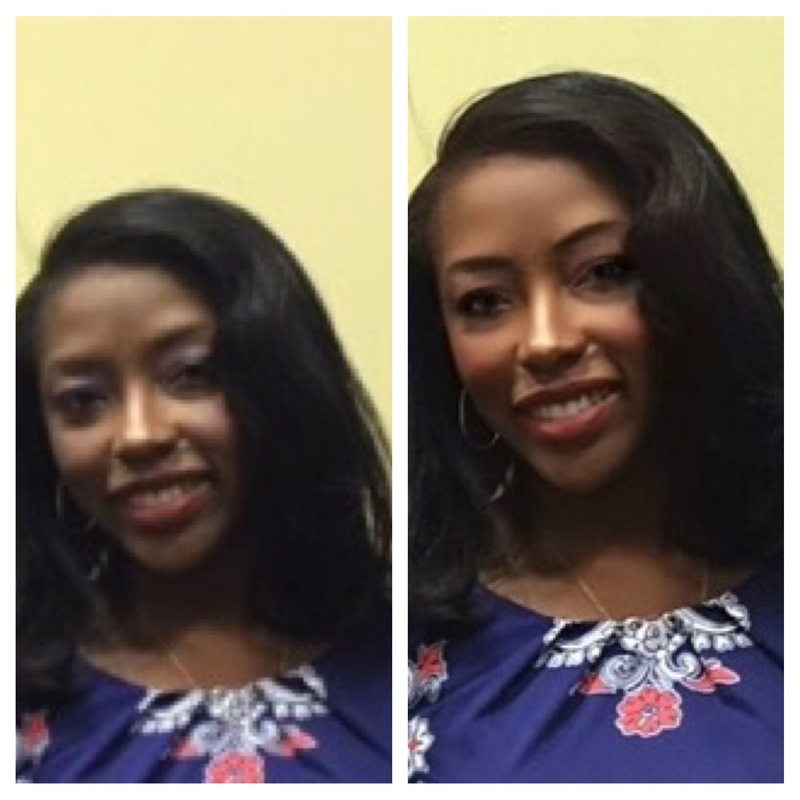 When I look at the before pic’s I feel like I look old, and tired. I thought I looked fine before the app, but now I find myself putting on more make up these days. All my adult life people have been going on about how I look so young. When I look at myself through the app I feel like I look haggard. I’ve been using this app for a year now and I have to say it is definitely chipping away at my self-esteem. I know I can’t be the only one that feels this way? When you step back and look at it from a bigger standpoint the app was created with someone else’s beauty standards. These standards are not the law of beauty, but it’s easy to get caught up into thinking it is. It’s easy to look at yourself through another’s eyes and feel like your not good enough. What I think is needed is the confidence in one’s unique beauty. You should know your beauty lives inside and out. When you know this no one or thing can waver your self-assurance. I’m not quite there yet. Recently a new male employee at one of my jobs had never seen me without glasses. He told me I looked terrible without them. He claimed I looked so tired despite me wearing makeup, and I should never go without wearing them. Now I had not really been wearing glasses long. I had contacts since high school. I knew I looked fine. No one had ever told me I looked bad before. When I looked in the mirror I liked what I saw, but I let someone’s criticism make me think I needed to look better. I never even thought about how this dude was always making a pass at me and getting mad when I tell him to back off I’m married. I never considered that he probably wanted to just make me feel bad. So I started researching how to get ride of bags and dark circles like a idiot thinking what others thought mattered. Sometimes the masses will try to bring you down because they are jealous. My husband does not feel he should tell me I look pretty. He thinks I should know it and not need him to tell me. So he rarely comments on my appearance even when I ask. The problem with that philosophy is human being are vain. And despite the fact that we should be able to assure ourselves of our inner beauty we rely on others for validation. Thus comes the invention of the selfie. Society is caught up In hiding our flaws to prove we are the best through the amount of likes we get. 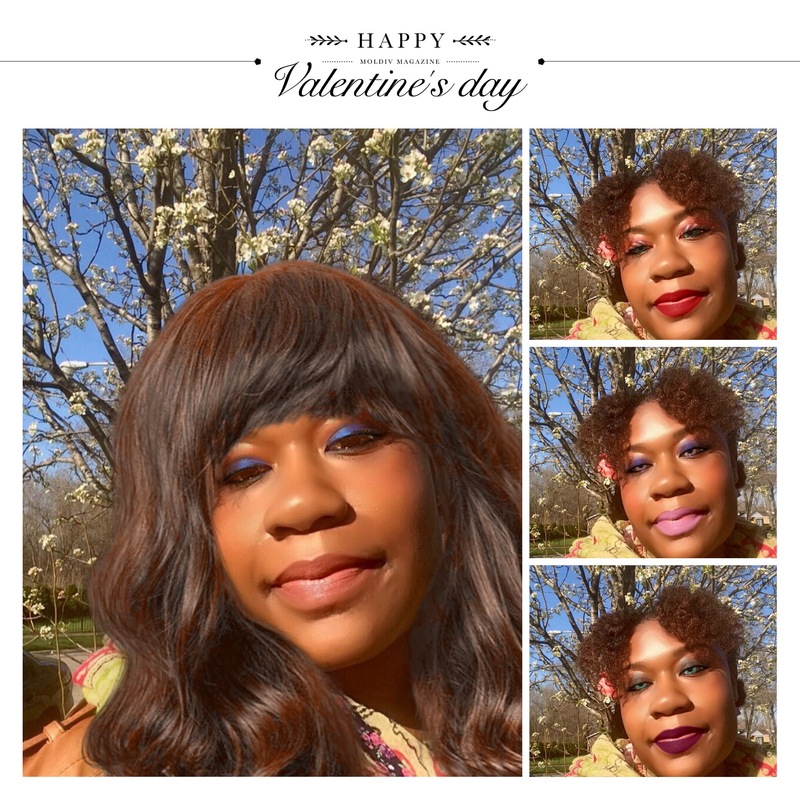 App’s like these are fun, and definitely can hide a bad skin day. But if we all get caught up into trying to look perfect what happens to the unique person inside? Young girls and women will get caught up competing with something that’s not real. Men will have unrealistic expectations of beauty. Not to mention you can really cat fish someone into thinking your a model. Would you want to live In a world where nothing is real and no one is truly themselves? I think we really need to keep an eye on who we are inside, and not let apps and social media dictate beauty standards. Last night or early in the a.m. 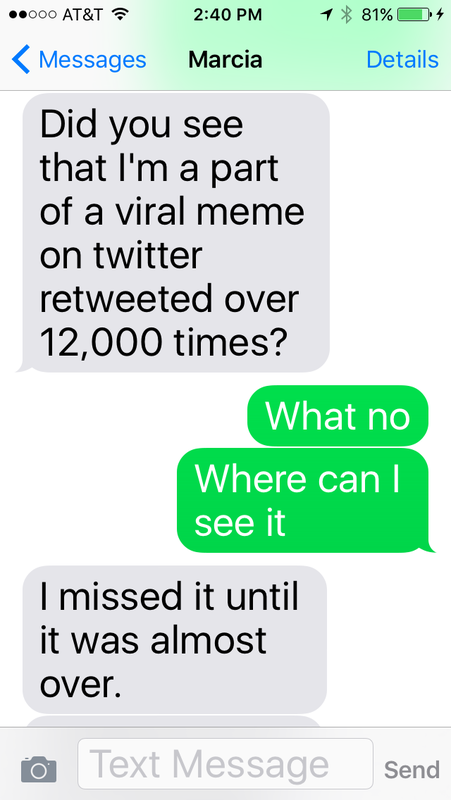 I received a text from my big sister. I had just read about a married couple being used in a viral meme that falsely depicted their relationship. Worried and curious I grabbed my kindle and launched the Facebook app. The notification icon lit up and I saw my big sisters post. 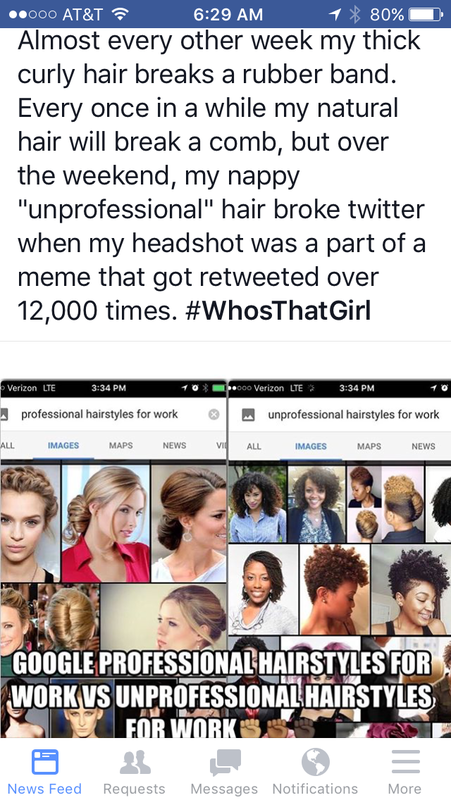 She is featured in a meme that depicts African-American hair as unprofessional for the workplace in a Google search. Here are her two cents. Check it out. Now in some ways I completely understand the algorithm explanation. 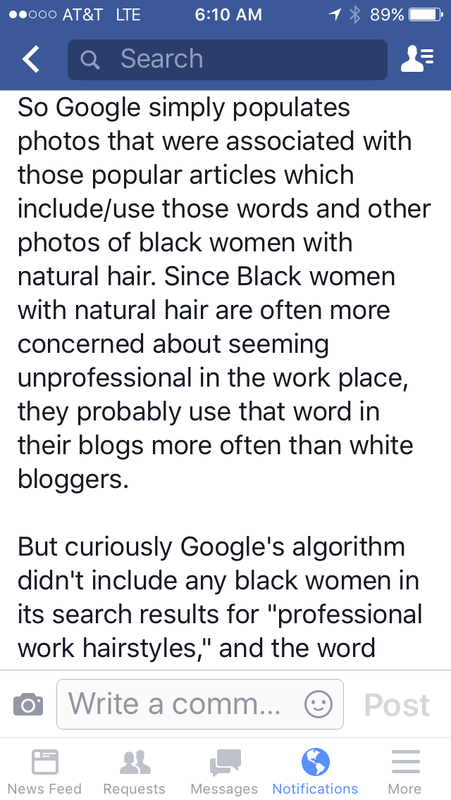 However, as my sister pointed out the blogs written by black women more than likely has the phrase professional hair in it too. I call foul on this excuse. 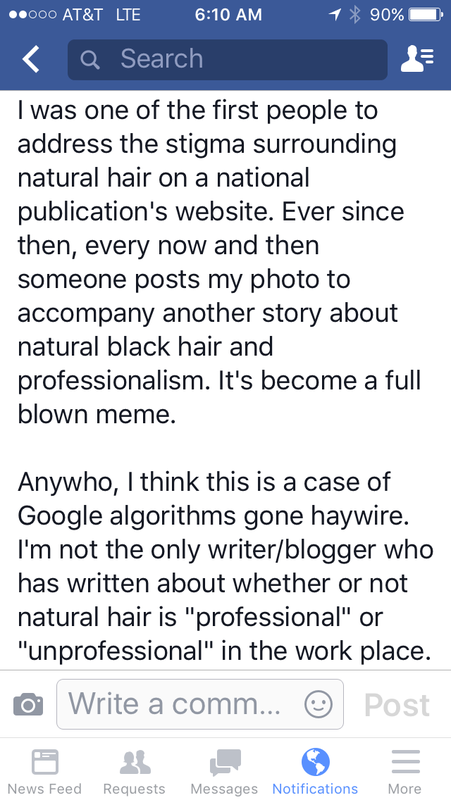 I don’t have proof but a month ago I did a search on Google for natural hairstyles. My search results contained a Bevy of pictures of Caucasian women. I thought OK… maybe I should be more specific. Then searched natural hairstyles for African-American women. Majority of the picture still were of Caucasian women. I should’ve took a picture right when it happened. I was on the train on my way to work. 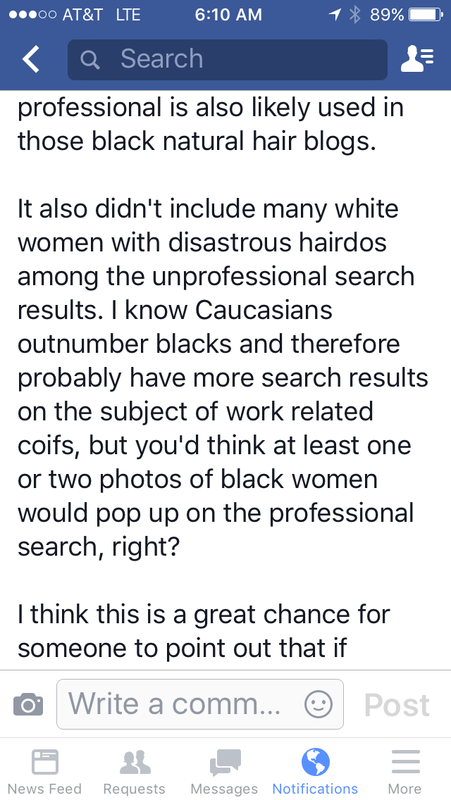 When I re-did the search later on that night I got pictures of African-American women. It may have been because I was on my way to downtown Chicago and I was in a predominantly Caucasian area. When I re-did the search I was home on the southside again. I just know it confused me very much. Why would my search results change based off of the area that I’m in? Some people may use the reasoning that african-Americans are a minority so we may not come up as often in searchers. However the purpose of the search engines are to give you the most accurate results. I feel that regardless of where you are if you search for something that is for African-Americans you should get African-American result. 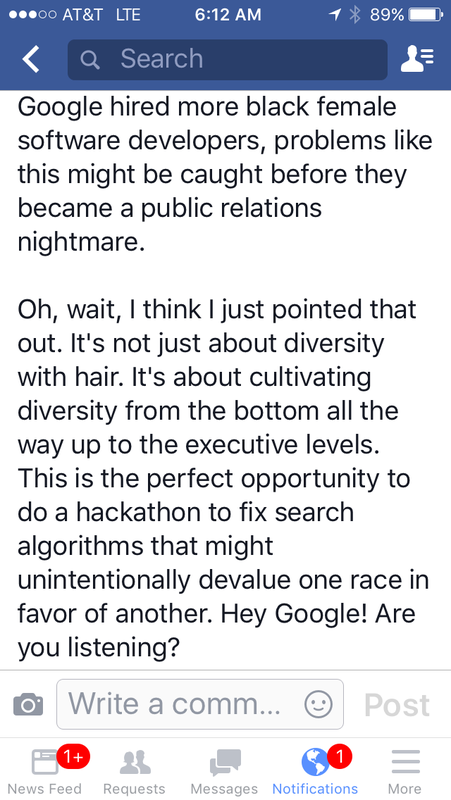 I Also feel that no matter what ethnic group out number the other the search results should show a vast array of ethnic groups. 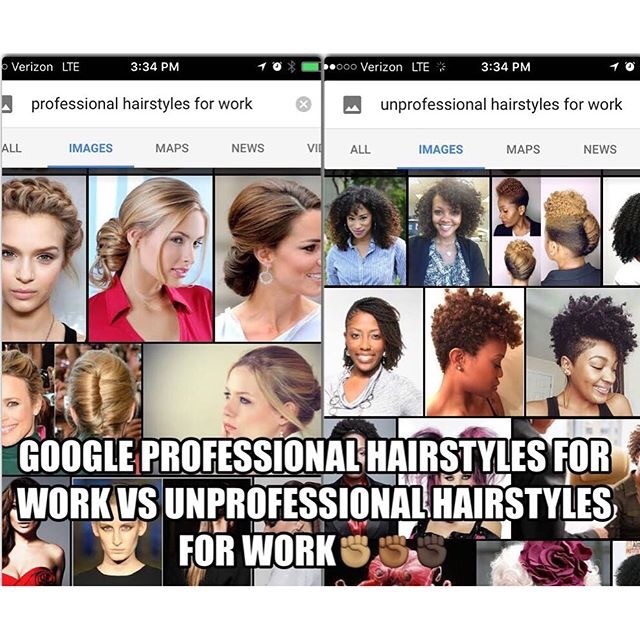 I feel it was very suspicious that the unprofessional hairstyles in a workplace search contained almost only African-American women and vice versa for Caucasian women. I believe it speaks volumes of how society tries to oppress African Americans and other ethnic groups. They try to brainwash us into thinking our hair and features are not beautiful. The best way to keep perpetuating that way of thinking is to have the power and means to control what we all see as beauty. If it seems like the majority thinks that beauty is light skin, straight hair the masses will except it as so because there is nothing to contradict that thought. As diverse as America is it seems too easy to say this is a result of search algorithms. What are your thoughts? So I came across this Pinterest post that stated that cooking spray can be used for a Quick dry manicure. Of course half the things online are completely stupid but I decide to try this out. Strangely enough it actually works. The reason why I tried this out is because I have a hard time getting my nails to dry in time for me to go to work or church. I tried doing my nails before bedtime.When I wake up they are a complete mess. Even if I do my nails two hours before bed. Even if they seem dry to the touch. I wake up in the morning, and it’s smudges and fabric pieces. Not to mention the stains on my pillow case. So when I saw this life hack I thought why not give it a try. I sprayed my nails with Pam which made an awful mess everywhere. Note only do this above the sink. And lo and behold my nails are dry😳. Well further research is needed for that answer. I’ll get back to you if I find anything out. 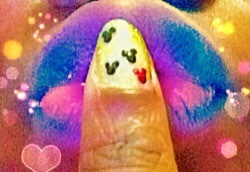 I made my own glitter Mickey Ears. So like most morning I started my day on YouTube and Pinterest looking at DIY’s. 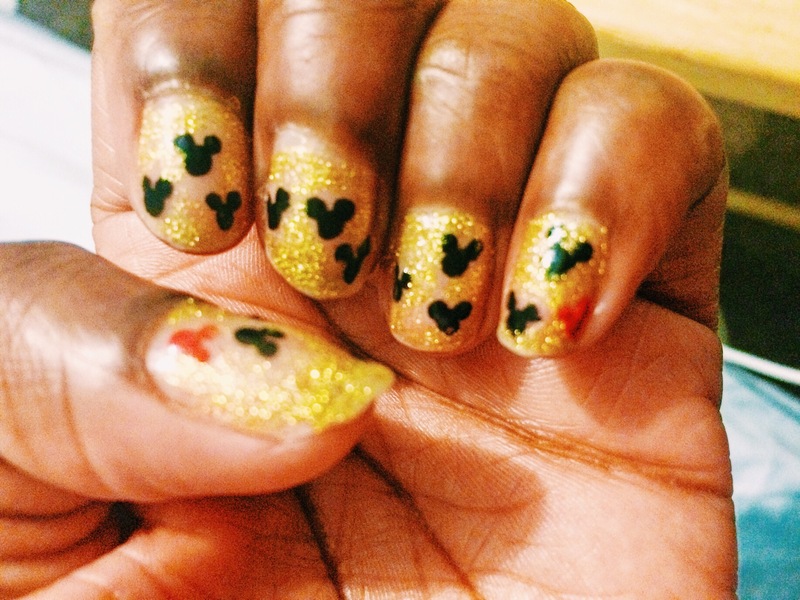 I just got a really cool job at the Disney Store and I’ve been really into Disney DIY. 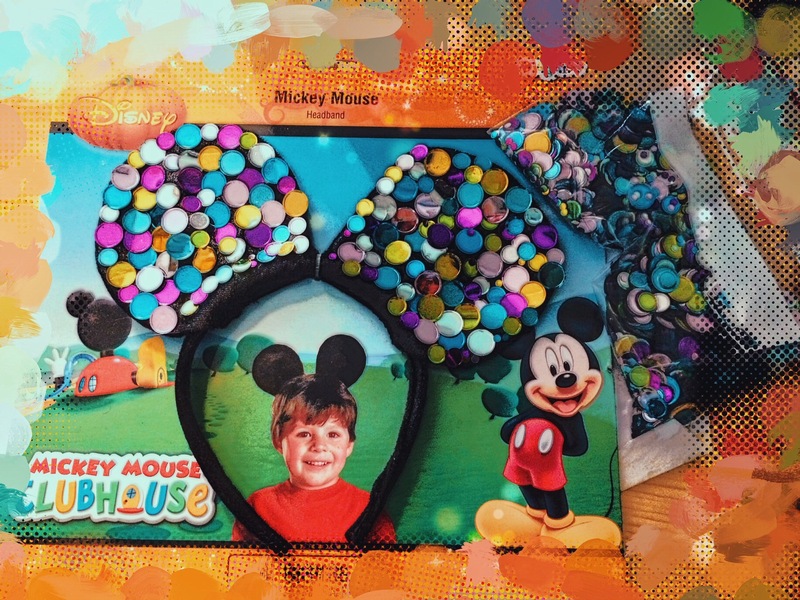 I came across this video on YouTube where this one vlogger was gluing sequins onto Mickey Mouse ears. Later that day I had to go on an errand for my sister to pick up some Mickey Mouse decorations for my nephews first birthday. She sent me to party city with some money from my mom and an unfinished list. My sister is a little indecisive at times so it left me wandering around in party city with only 10 minutes before closing. I was waiting on her to respond to my text weather to get one thing or another when I came across these ears. They’re Mickey Mouse ears for a kid, but I think they can fit my head too. After finding the ears it sent me on another scavenger hunt of my own looking for a substitute to sequence. I need it to be affordable cause I was using the leftover change that my mom said I could keep. I really don’t have money right now to just do DIY’s on the spur of the moment. But luckily after asking some of the employees I found the perfect solution Large Confetti! I used Fabric glue that I keep at my house to repair torn Clothes. It was a relatively quick DIY. I might add a bow later I haven’t decided. Let me know what you think. I’m thinking of consolidating my Facebook pages. It’s been a long time since I started my Facebook page What My Hair Is Doing Today. It stated off as a photo album on my personal Facebook page. 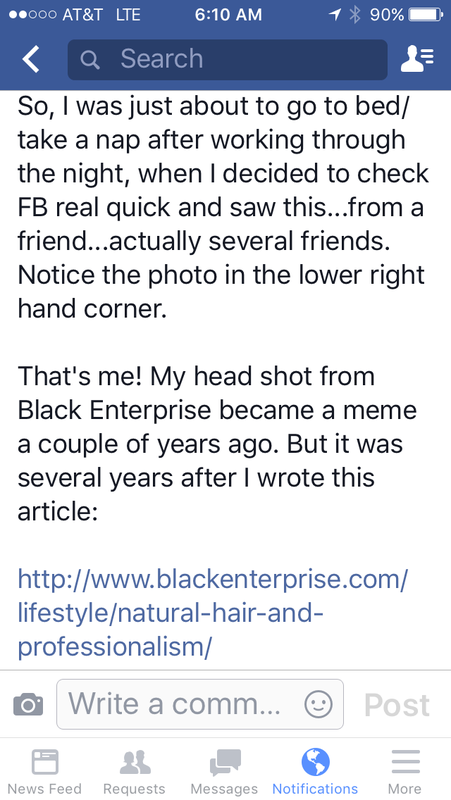 Then I decided it was getting to big for my page, and decided to commit to natural hair blogging. I went from not being able to get friends and family to like my page to strangers taking an interest. As of today I have 320 likes. It’s not much but at least it’s something. At least I know I’m not doing this just for myself. 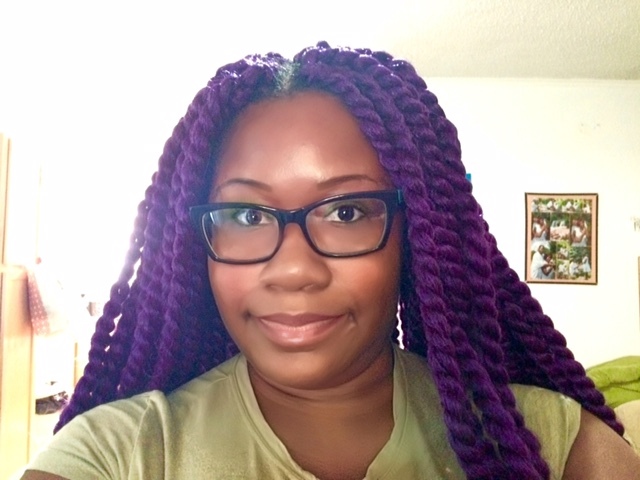 Recently I started this new blog because I wanted to talk about more then just hair, fashion,and beauty. You can see that clearly from my last post. I also started a Facebook page for the blog. Right now I only have 33 likes and I’m sure majority of them are my Facebook friends. That’s better then the last page start up right? So now I have a total of three Facebook page pulse my personal page. I haven’t been able to post new music to my music page cause I’m always busy with my two jobs. I want to change that. So I need to consolidate some things. One thing that has always bugged me in the past was how long my hair Page name is. 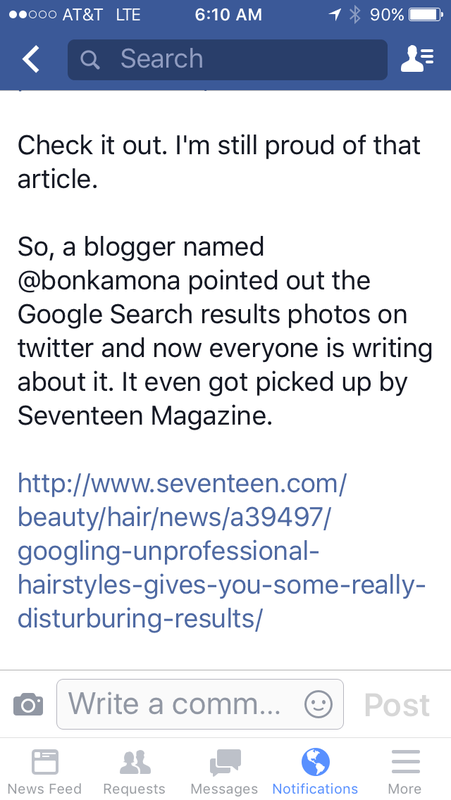 I always regretted not coming up with a short catchy name like a lot of bloggers was able to do. Then one day I realized I was changing and growing. I had a lot more I wanted to say. Then suddenly the name hit me Chubbycurl. I feel like the name came to me when I needed it. When I was going through some changes and needed something to signify that. Lately I’ve been thinking of making What My Hair Is Doing Today apart of Chubbycurl. They would be one and the same. 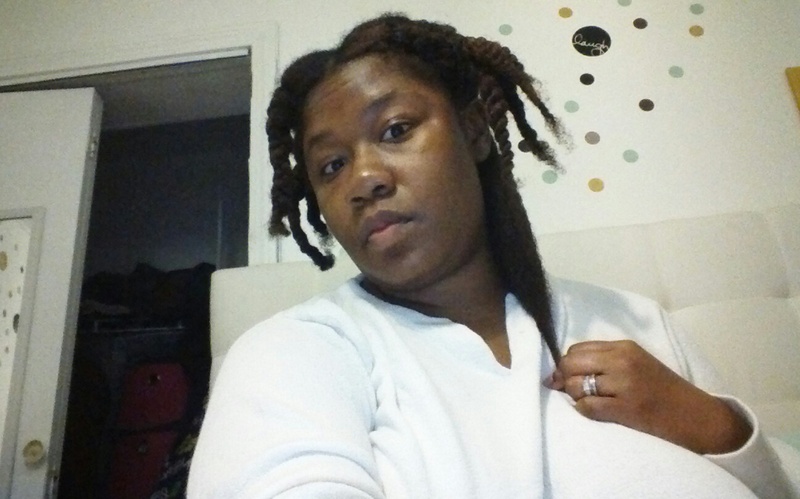 I want to consolidate my hair and blogging page. 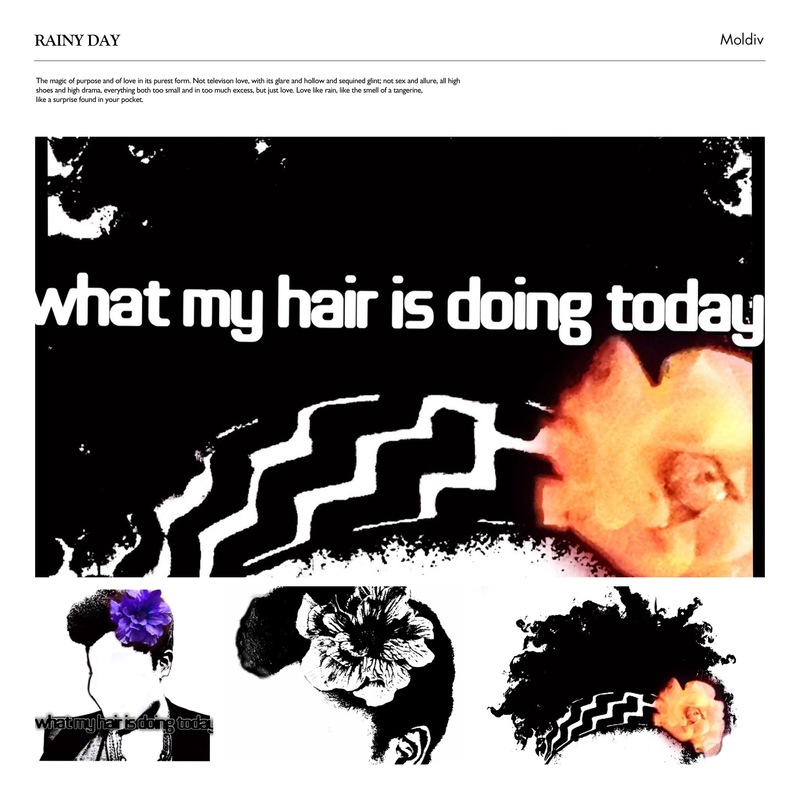 So it would be What My Hair Is Doing Today presented by Chubbycurl. WMHIDT would be a segment on chubbycurl. 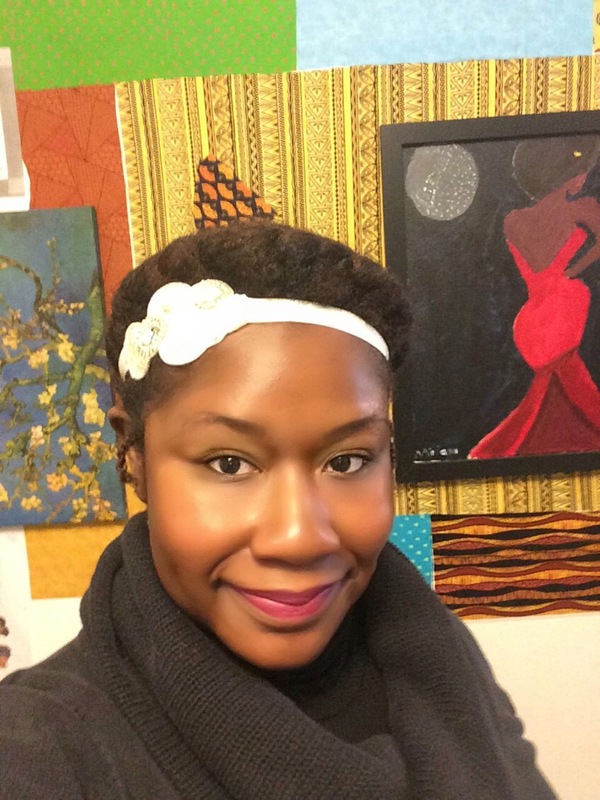 I want to still talk about natural hair care, but I want to also present my audience with a wider range of content. So here is where you all come in. A little while ago I made a post on WMHIDT asking how my subscribers would feel if I changed the name. I got no response, so this left me with more thinking and questions. If I change the name will anyone notice? Will it cause confusion or loss of subscribers? 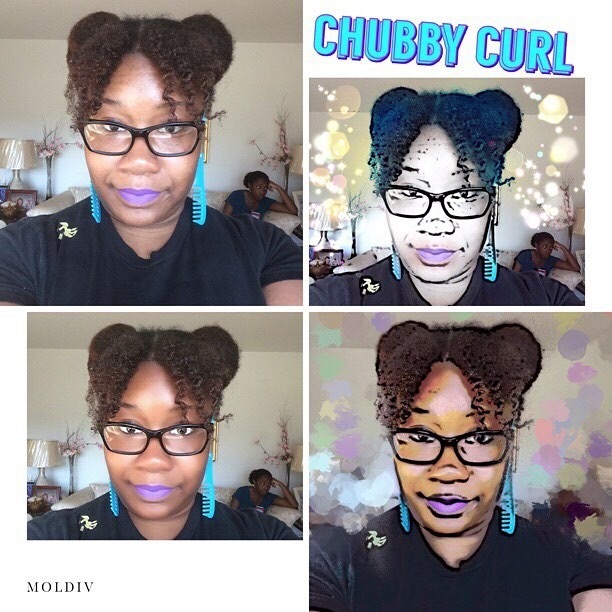 How will I get my Chubbycurl page subscribers to move over to the hair Page. I really want to know what you the subscribers think. So before I make any changes please let me know how you feel. If no one has anything to say I will be making changes at the first of the month. I’ve been thinking about some things for a couple of years. 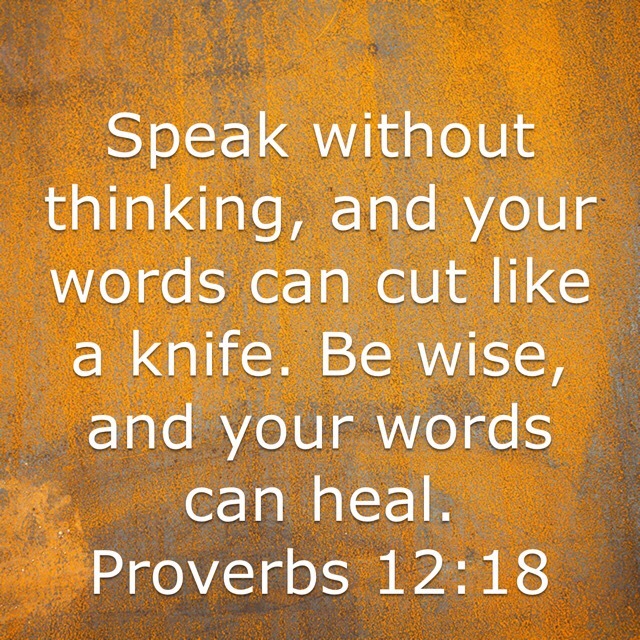 I’ve been going over in my mind all the times people have said unnecessary hurtful things to me. This is not healthy I know, but I hope that maybe I can use my elephant like memory and life lessons to help others going through it right now. So for me I’ve always noticed when I’m doing well someone will disguise themselves as a friend and begin to overly criticize me. Now at the time I don’t know I’m doing well but I’m on my way to something big. I usually don’t see it till later which is the case for most people. What these people are trying to do is pull down my self esteem. I never think of the perfect comeback till later because it always takes me by surprise. I’m going to give you some examples of situations and how to shut them down and stave off further attacks. Sometimes this scenario comes out of know where from someone you’ve known for a short time. You’ve grown comfortable with them so when they say somethings critical it takes you back. I remember when I was dancing with this one friend at church. I had done the choreography but I was not confident in it. I asked her opinion which was mistake number one. If you don’t know someone well enough don’t let them know when your feeling vulnerable. I should have said something then, but I really didn’t see that coming. I thought she would say you need cleaner lines, or your timing is off at this one point. What I should have said was what was the purpose of your critiques? When someone says something totally unneeded and mean you can usually shame them by asking them what was the purpose? Did you think what you just said would make me feel good? If not then why would you say something to hurt me? Did you really think this would help me grow? If I had said this in the beginning I would not have had to deal with this same criticism for years from this person. She even said it to a teenager once which made me feel like I was failing at being a strong leader and roll model. What I realized later on was that even though we were friends she had some jealousy issues. For years people would come to me and tell me she talks about me behind my back. She felt the need to criticise me because she wanted somethings I had in my life. At the time things she would say like that would send me into a depression. I would start over thinking everything I did around her because I thought she reflected what everyone thought about me. I once had a friend that was so critical of everything I did it became extremely exhausting to be around her. I once got physically sick from spending the day with her. I cut off that relationship because I felt at the time I needed to look out for my own well being. Now when I look back on things I should have approached that situation differently. The way I should handle things is if she gave criticism about me. Like about my wedding, marriage, or family life. Instead of disputing her claims and being drawn into a debate with no end. I should have asked this simple question. Are you ok? I knew she had a lot of problems in her life that may have been bothering here. Things that would make her reflect anger on me. When she criticized how she hated my wedding. I should have thought about how her wedding had been postponed and she had no ring to show for her engagement. I could have asked are you upset because things in your life aren’t going to plan? She use to try to be really controlling and overbearing to everyone around her. We didn’t have problems till I started to nip that in the bud. What I realize now and what I’ve taken from that relationship is that people try to put you down and control you because things are going out of control in other parts of their life. These are things they can’t control so they try to find things and people they can control. Pay close attention to your friends underlying problems. Check in on them when they start to pick at and focus on your flaws. Make sure they are ok emotionally. They may not admit it but at least you tried to be there. Example 3) Maybe they just don’t realize they are being mean. It makes us sad when he says this because we really don’t know what the problem is yet. My dad thinks he’s being funny. But when you’re going through, its no laughing matter, so I tell my dad that. I let him know it makes us sad when he says things like that. He really doesn’t get it but at least it keeps him from making that joke for a while till he forgets. Then we tell him again. Sometimes people don’t know when they are being overly critical and hurtful. If you don’t speak up and let them know they may never know. Like my dad they might think they are being funny. 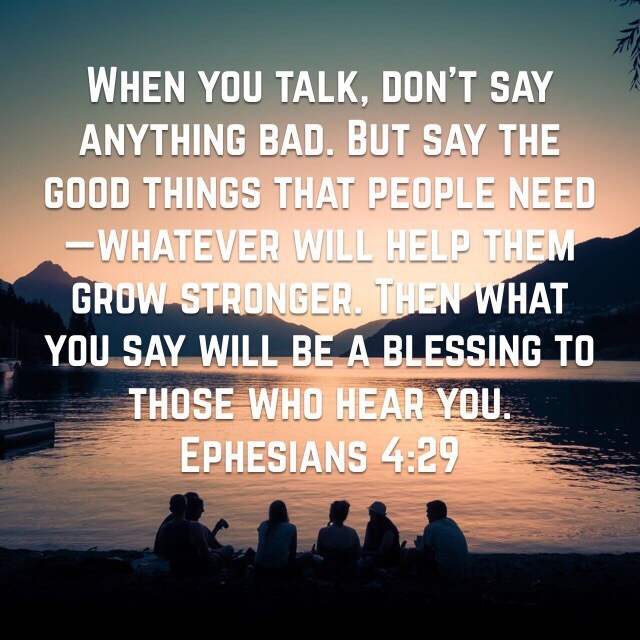 If you don’t say anything they can go around hurting others just like they hurt you. 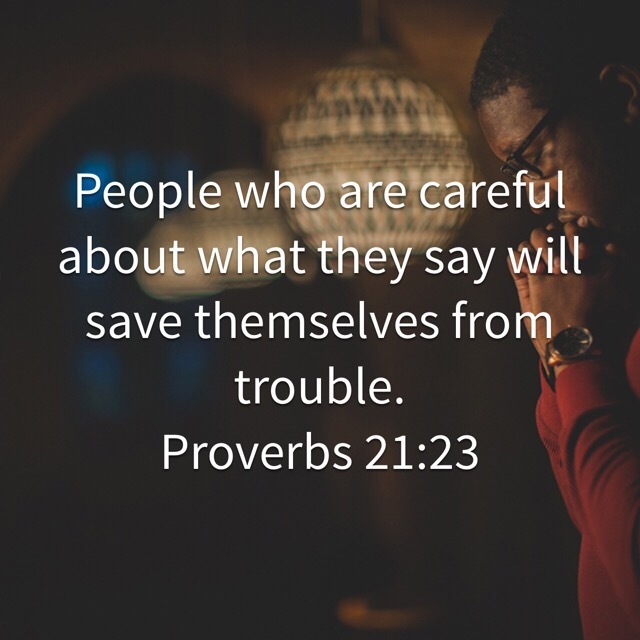 Recently I read about how some people were criticizing pastor T. D. Jakes. Some people didn’t like him wearing ripped jeans at a church he was visiting. On person even commented on his Instagram photo saying he needed to set a better example for his flock. I had the same situation with my church dance team a while back. I wanted to dance to Out of Eden my favorite Christian contemporary group. Two other members of the team felt that it was inappropriate to dance to Christian R&B/hip hop. Everytime I would bring up dancing to a Out of Eden song or a cross movement song I was told that’s not kingdom music. That’s not praise and worship music. That music does not have the anointing of the holy spirt. So I would just back down. I had a Vision with these songs. I wanted to use them to reach younger kids in the church. I should have had confidence in my own knowledge. Instead of backing down I should have asked where is the scriptures? Where in the bible does it say only one type of Christian music is holy? I should have told them about the story I was trying to tell, and the verses I had to go with it. I should have never backed down. Sometimes people just criticize you with out proof. If you stand up for yourself and ask them to show you the proof they can back down. 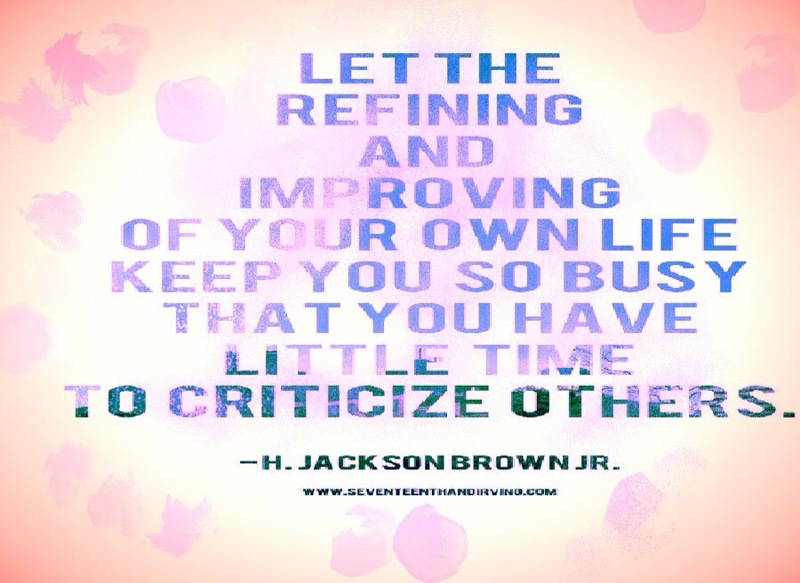 They just want to criticize for the sake of criticizing. Everyone has flaws no one is perfect. What’s the point in honing in on someone else’s flaws and pointing them out constantly. Instead of focusing on everyone else focus on yourself. Focus on your flaws and making yourself better. This is the way I see it. The world is a hard place why should we make it worse by tearing each other down. 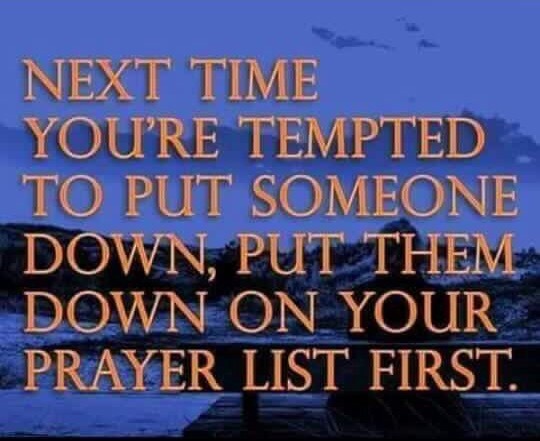 Especially Christians if we tear each other down there will be no one standing with you on the battlefield. Or worse broken weak people all around you that you help build. Is that the world you want to live in?